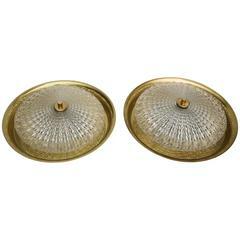 A pair of circa 1940s French beaded crystal flush semi flush mounted ceiling fixtures. Sold individually. 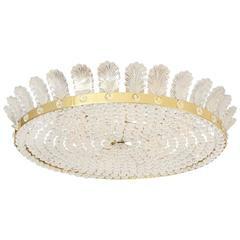 Six interiors lights. Sold individually. Measurements: Drop 13" Diameter 25". 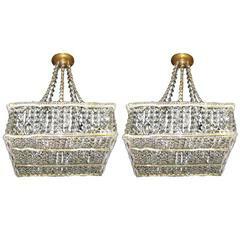 A set of square French gilt metal and beaded crystal light fixtures. Beaded crystal body and chains. Adjustable drop. Measurements: Height 32 in., sides 18 in. 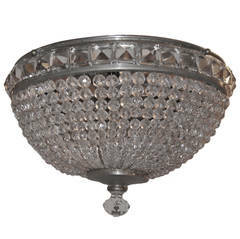 A pair of circa 1930's French crystal beaded flush mounted fixtures with interior candelabra lights. Measurements: 14 3/4&quot; diameter, 9&quot; drop. 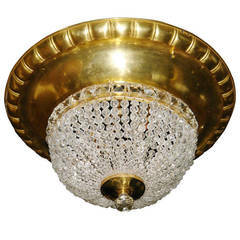 A Italian gilt metal light fixture with crystal beads and interior lights, circa 1920s. 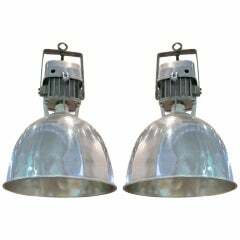 1940s pair of Industrial aluminum light fixtures from a factory in France.